Serious, humorous, and insightful, this historical novel chronicles a vanished way of life; it’s a must-read for adventure-seeking youth. 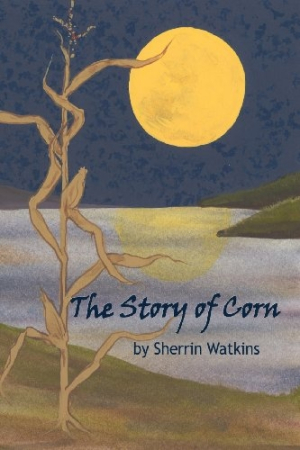 In Sherrin Watkins’ The Story of Corn, an unnamed fictional Shawnee and reformed alcoholic tells his coming of age story as a twelve-year-old just before the American Revolution. Using the stages of preparation, seeding, tending, and harvesting corn as the structure for the well-paced novel, Watkins adeptly blends historical facts with daily life and details the boy’s experiences in the mid-eighteenth century as he edges toward becoming a warrior. Watkins is eminently qualified to author this book—she is a Cherokee Shawnee and has written other children’s books on the subject, one of which, Green Snake Ceremony, won her the Gamma State Author’s Award. The Story of Corn begins with the elder Shawnee recalling how, as a twelve-year-old on the last night of the Spring Bread Dance, he told frightening ghost stories to younger children in the dark. They panicked, and, in the confusion, his brother, Warbler, and their nephew, Rabbit, were pushed into the Muskingum River, barely escaping with their lives. From there, the trio and the narrator’s Uncle Wildcat go on to other adventures and misadventures, some serious, some humorous, but all offering insight into a vanishing way of life and all written in clear, clean prose. The front cover wraparound artwork of a cornfield under a full moon is a perfect fit for the theme and content of the book. However, some readers may be put off by the small type face of the text inside. Others may find the lack of a name for the hero to be disconcerting. A map of the Shawnee claimed territory would be a welcomed enhancement. All in all, The Story of Corn is a must-read for understanding and appreciating the Shawnee way of life and the impact of white settlers upon it in the mid-1700s.